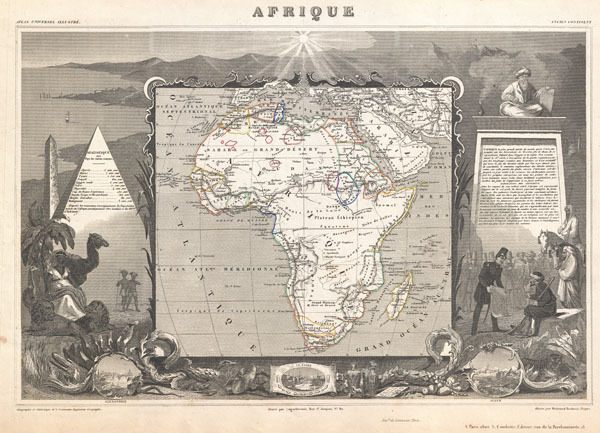 A stunning c. 1847 map of Africa by French cartographer Victor Levasseur. Depicts the entire continent with several interesting elements. A large lake appears in Mozambique which can only be Lake Malawi (Lake Nyasa). Lake Chad (Tchad) is also shown. Names numerous African kingdoms including Monomotapa and the Hottentots. Surrounded by the elaborate borders for which Levasseur is best known. Shows a stylized pyramid and obelisk, an imam, a French soldier consulting with Arabs, and three city vies: Alexandria, Cairo and Algiers. Prepared and published for V. Levasseur's magnificent c. 1847 Atlas Universel Illustre, one of the last decorative atlases of the 19th century. Levasseur, V., Atlas Universel Illustre, c. 1847. Rumsey 0427.094. Phillips (Atlases) 3003.